One of the marvelous things about the Star Wars franchise is how it engages people’s imagination. Just like countless other kids in the late 70’s, the hubby spent a good chunk of his time drawing TIE-fighters and pretending to be shooting at stormtroopers. Now a generation later, our kids are drawing X-wings and having Lightsabers fights. One of the things we have noticed is that the kids don’t need, or even prefer the licensed items (as cool as many of them are) to have fun. Our daughter is making plans for a Sabine costume with foam and acrylic paint, and our son is usually armed with a bubble wand and a glow stick lightsaber. 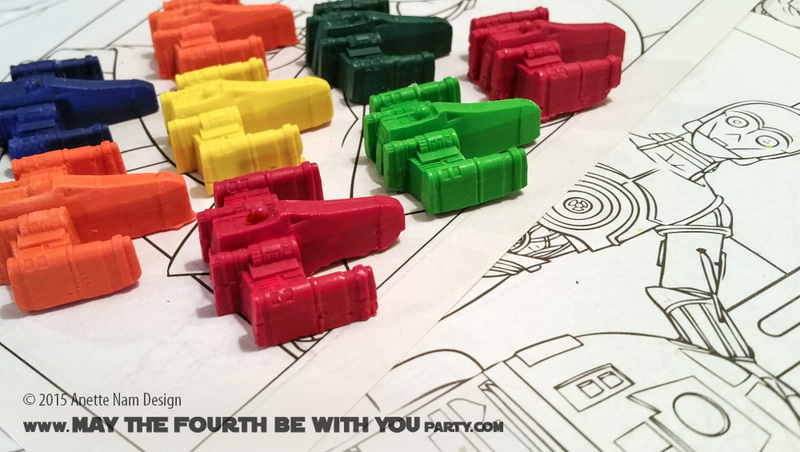 We have TIE fighters and star destroyers being built in colorful Duplos and Legos, as well as various robots being made with cardboard boxes. And of course Star Wars drawings in all colors and sizes. We try to encourage the kids’ imagination and creative sides, and are thrilled when they want to make things themselves. 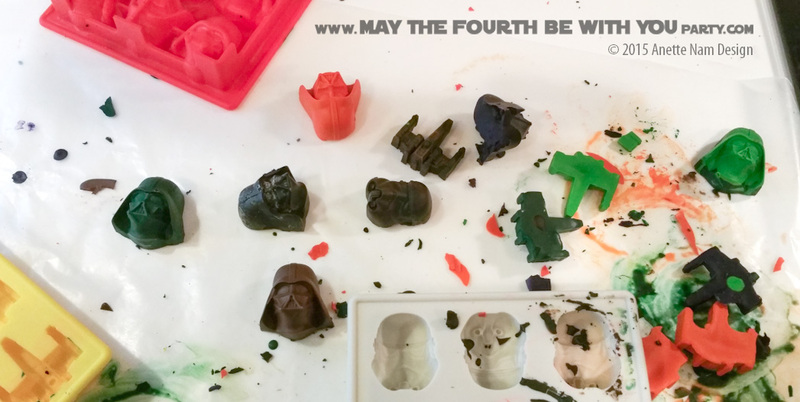 So to set a good example, on a rainy Saturday we decided to make our own Star Wars Crayons. 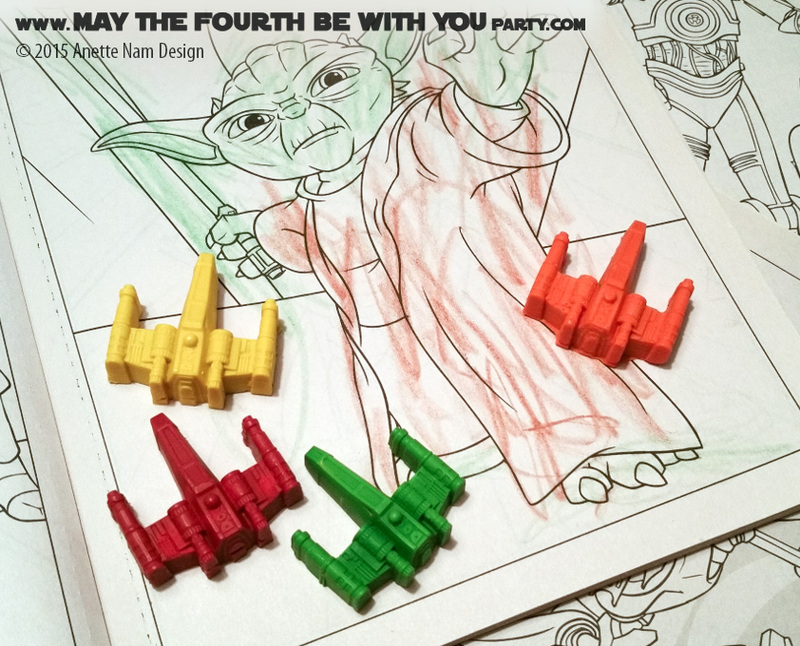 They make awesome Christmas gifts, or perfect favors for a Star Wars themed birthday party. Microwaveable Plates or Cups (or small pitcher if you are only doing 1 color at a time). They might end up getting stained, so don’t use your fancy china! We used Corelle Livingware plates. Set up your workstation. We made a big mess, so it was a good thing we had covered our whole countertop with wax paper. 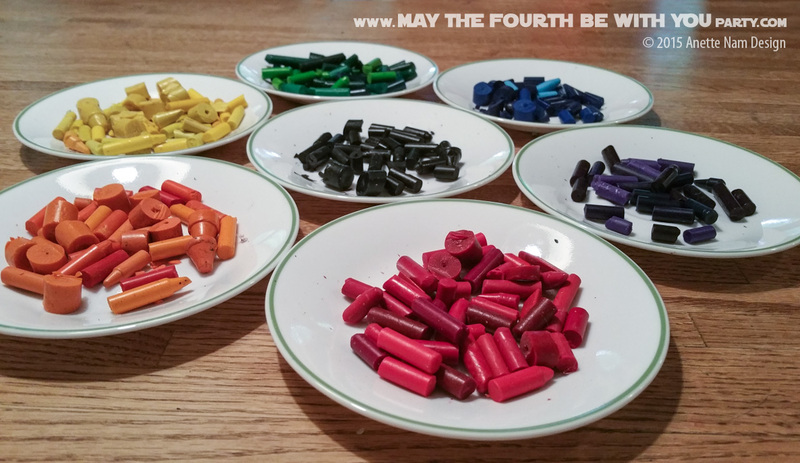 Break/cut crayons into small bits, and place on a plate (1 for each color). Taking 2 or 3 colors at a time, run in the microwave for 30 seconds, take out and stir with a chopstick. Repeat until entirely melted. Since some crayons melt much slower than others, you may have to repeat a few times. Carefully pour into the molds. Note that the plates and the liquid crayons will be extremely hot, so make sure you protect your hands. Take them out, grab some paper and let you imagination flow! Steps 1-4 are great for kids, after that an adult needs to to the work. We used Corelle Livingware, and it worked great, no staining! Once you have poured the liquid in the molds, wipe the plates off with paper towels – BEFORE the crayon hardens. If it does harden, just pop it back in the microwave for few seconds to melt it again. 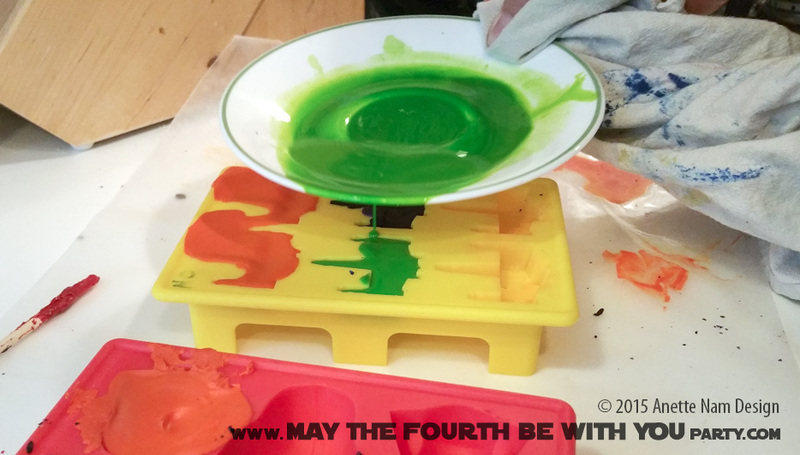 I’ve since seen you can put the broken crayons directly in the mold, put the mold on a baking sheet (covered in wax paper) and put the whole thing in the oven. Less mess, but it is much harder to get the crayons sized correctly. 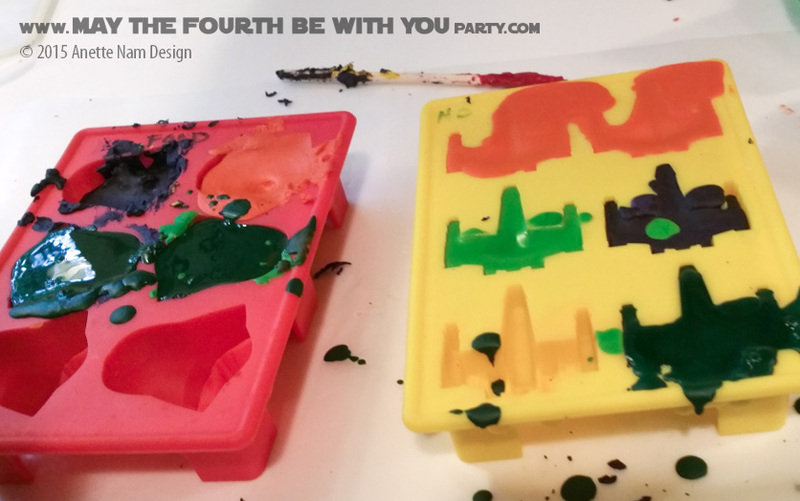 Just like with the Star Wars soaps, once you use the Silicone trays for crayons, I recommend that you do not use them for food again.